One of the most special moments of any wedding actually happens at the reception – that special moment when the bride and groom have their first dance as a married couple. As they approach the dance floor, the guests fall silent as they observe the beautiful moment. Honeymooners can continue the dance by reserving Dancing with the Bears, one of the many Wears Valley cabin rentals offered by Great Cabins in the Smokies. This charming little log cabin is the perfect choice for couples looking for a quiet romantic honeymoon experience. Dancing with the Bears is a 1 BR, 1.5 BA Wears Valley cabin that oozes coziness from every corner. An open living area invites you to come in and stay awhile. Comfortable leather couches and tasteful furnishings are an integral part of this honeymoon hideaway. You’ll find yourself burrowing in as soon as you arrive. The bedroom of this darling den features a king-sized bed and private bath, including a jetted whirlpool tub. Step in and massage away any stress that might be left over from wedding preparations and new in-laws. Or soak your cares away in the outdoor hot tub on the screened in back porch. In the morning, brew up a pot of coffee in the fully equipped kitchen and carry it out to the rockers on the porch. Absorb the beautiful view and fill your lungs with fresh air as you plan your day’s activities in nearby Pigeon Forge or Townsend, TN. Located at the foot of Hatcher Mountain, Dancing with the Bears is one of the Wears Valley cabin rentals that’s easy to get to. Since it’s at the base of the mountain you won’t be traveling up windy mountain roads to access it. You can save the winding roads for a day drive through the Smokies. You’ll see some of the most amazing panoramic vistas during the drive, and will come to realize why the Great Smoky Mountains are so named. You may also want to take a trip to Townsend, TN. Explore the town, have lunch at one of the charming restaurants, and then head for Great Smoky Mountains National Park. With waterfalls, wildlife and winding roads, you’ll love exploring this amazing park. Watch out for black bears while you’re here; there are over 1,500 of them in the park. Regardless of the name of the cabin, we don’t advise dancing with them. Keep the dancing to yourselves while you’re here! We know you’ll love Dancing with the Bears while you’re honeymooning in Wears Valley this fall. 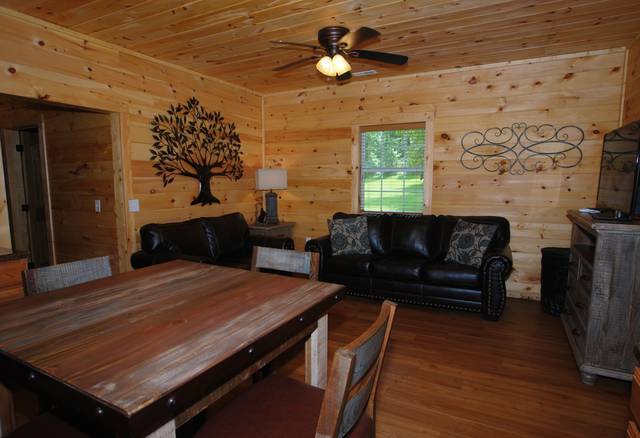 Give us a call today to reserve this charming Wears Valley cabin!